foam formula shampoo and free cloth 5 I really liked this product and the free cloth. Decent product 4 Easy to apply and serms to provide good coverage. Only issue is buffing off of glass. Effective, love the smell! 5 I received a 4oz sample with my last purchase. Used 2oz of the soap in my foam gun and 2oz in my bucket. Product worked well and foamed nicely, although maybe more is needed to match the pictures and video. I felt that it was very lubricious, the wash mitt glides over the surface with ease. It also has an amazing smell, love that subtle mint scent! One major thing I look for in a soap is how easily it rinses odd the car and this didnt give me any troubles! Smell is perfect, like Goldilocks, not too strong not too weak but just right! Cons:Not a deal breaker, but this may be the only McKees product where its price point is slightly higher than competitors. Coupons/sales, freebies, almost all other McKees products offset this though! Just a great brand! Xtreme Foam 5 Easy to use leaves a great finish and definitely lifts the dirt off the car so your less likely to damage your paint. XTreme Foam Formula 5 Great product. will purchase again. 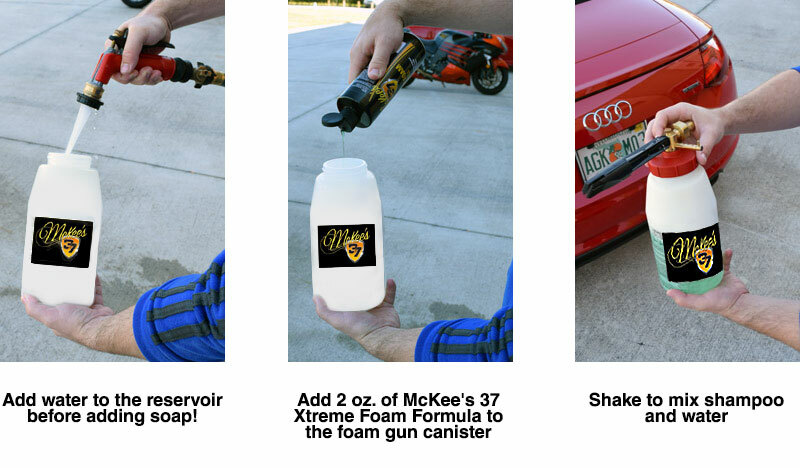 Xtreme Foam Formula 5 Foams a ton, Great in a wash bucket and a foam gun. the smell is very pleasant to work with! The thick foam helps soften dirt to prevent scratching.